Toronto, ON – 7 October 2015 – Family CHRGD, the final network to be rebranded under DHX Television’s iconic Family banner, is powering up on Friday, October 9, bringing with it unexpected entertainment that will have viewers on the edge of their seats. With an undeniable energy conveyed through striking colours and non-stop action, Family CHRGD will target kids 6-12 with an ‘anything goes’ mantra delivered through exciting series, specials and interstitial content unique to the brand. Accompanied by an OnDemand platform and the dedicated website CHRGD.ca, the channel’s multiplatform offering sets out to ensure subscribers get a daily dose of wacky, silly fun that keeps boredom at bay. Family CHRGD powers up on Friday, October 9 – click here for a sneak peek. Set to enthrall viewers and immerse them in the brand promise of excitement and entertainment that will blow their minds, Family CHRGD kicks things off with a full-day marathon on Friday from 7:30 a.m. – 9 p.m. ET, stocked with new shows, special episodes and homegrown hits. Series premieres for the day include: the animated Kung Fu series Xiaolin Chronicles at 9:30 a.m. ET; Horrible Histories, an unconventional take on history’s most gruesome yet funniest moments, at 10:30 a.m. ET; and Deadly 60 at 8 p.m. ET, which follows wildlife enthusiast Steve Backshall on his search to find the creatures that others spend a lifetime avoiding. The 13-hour marathon will be rounded out with popular series including the original hit Gaming Show (In My Parents’ Garage), Pac-Man and the Ghostly Adventures, World of Quest and Be the Creature. Also part of the schedule throughout the fall will be Disney’s Mighty Med, Phineas and Ferb, Kickin’ It and Penn Zero: Part-Time Hero. 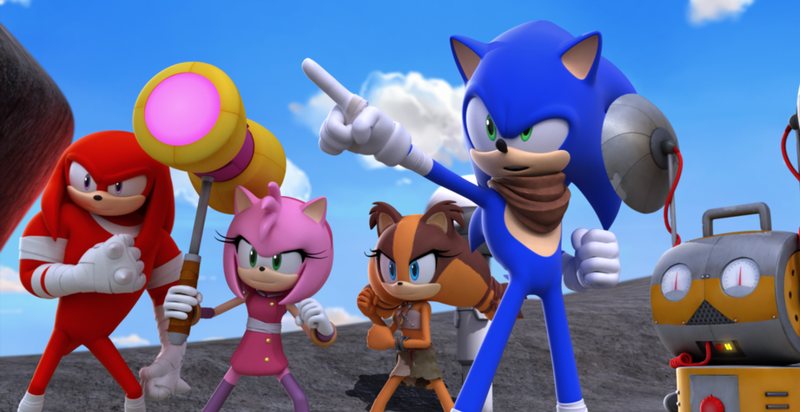 Family CHRGD takes viewers to the next level later this month with the energetic new CGI-animated series Sonic Boom. Based on the popular video game, where the infamous blue blur and his trusty sidekick Tails set out to thwart arch nemesis Dr. Eggman, the series is an action-adventure that delivers a burst of comedy and plenty of adrenaline. The show debuts on Saturday, October 24 at 10:30 a.m. ET following a triple-stack of Gaming Show (In My Parents’ Garage) including a new episode at 10 a.m. ET. Keeping fans plugged into the video game excitement, three back-to-back episodes of Pac-Man and the Ghostly Adventures will also air on October 24 beginning at 3 p.m. ET. Other programs debuting on the channel later this year include specials from Mattel’s Team Hot Wheels; the underwater animated adventure The Deep; new episodes of the popular Canadian series Slugterra; and from Radical Sheep, the comedic Fangbone! about a young barbarian from Skullbania. Transforming the spirit of unexpected surprises from the network to everyday life, Family CHRGD is giving gamers the chance to level up with the Go Gaming with CHRGD Contest. Fans can win the awesome grand prize of a $2,500 gaming shopping spree with Jesse Sukunda, host of Gaming Show (In My Parents’ Garage). The contest is open from October 9 – November 13 and fans can enter by visiting CHRGD.ca. The Family CHRGD brand will be extended to Family CHRGD OnDemand – the channel’s dedicated subscriber viewing platform – and the CHRGD.ca website beginning Friday. Both destinations will be home to videos from popular series including Gaming Show and Pac-Man and the Ghostly Adventures, plus Mighty Med and Phineas and Ferb will be available throughout the fall. Family CHRGD OnDemand will be refreshed with episodes from the new series as they debut on the network. Additionally, CHRGD.ca will be stocked with games, schedule information and more contests to keep site visitors curious and coming back. About Family CHRGD is an advertising-supported digital specialty network that features animated and live-action programming. Designed to surprise and entertain young viewers, Family CHRGD showcases series, movies and specials that will blow kids minds and keep boredom at bay. Ensuring access is available to subscribers when they want it, where they want it, Family CHRGD is also available through Family CHRGD OnDemand and Family CHRGD Online at no additional cost. Visit us at CHRGD.ca. About DHX Television is comprised of Family Channel, Family CHRGD, Family Jr. and Télémagino, and is part of DHX Media Ltd., a leading creator, producer, marketer and broadcaster of family entertainment. Dedicated to celebrating family fun, DHX Television delivers best-in-class programming through premium subscriptions and its original production mandate, and creates and produces captivating in-market events that appeal to Canadian families. DHX Television is home to world-renowned series including The Next Step, Degrassi: Next Class and Teletubbies. DHX Media Ltd. has offices globally, and is traded on the NASDAQ and Toronto Stock Exchange.